There’s a beast lurching under us, its inky tendrils threatening to pull us under and devour us whole. Is it a kraken? A mysterious monster from the briny deep? Not quite. It is, without a more delicate way to say it, Skinner Box gaming. I used to love multiplayer games. Before I got my first console, a hand-me-down original PlayStation in 2002, they were all I played. Most of my first decade playing video games were spent as the fourth man in a four man Diablo II group, or as the worst player in a session of GoldenEye 007, or as one more misbegotten soul doomed to the hell that is Mario Party. In those days, the halcyon days of online gaming, merely being able to play with someone else, anyone else, was a novelty. Just sharing the experience was enough. There was an Indian kid, around my age, that I played Diablo II with in the early hours of the morning for months. I don’t even think we beat it. I wonder where he is now. I preface with all of this, and mention several late ’90s games, to announce to you, the dear reader, that Rare is back. That purveyor of classic Nintendo 64 games (Perfect Dark, GoldenEye, Banjo-Kazooie) had faded into the mists over the last two decades to the point where I think most people just assumed they were defunct. The last time I remember them doing anything meaningful was when they became Microsoft’s first major signing, launching the abysmal Perfect Dark Zero with the Xbox 360 in 2005. They’ve made other games since then, but this week, with the release of Sea of Thieves, they’ve once again become something I enjoy. This game has the best sunsets. And don’t get me started on those northern lights. Truly, they make for an unforgettable luncheon. If you have any interest in Thieves, you’re likely to hear a lot of hemming and hawing about what exactly there is to do in it. To put it simply: you are a pirate, nameless and relatively faceless. You sail the seas and look for treasure. There are three companies with which you can find employ: the mercenary Gold Hoarders, the officiant Merchant Alliance, and the sinister Order of Souls. These three companies will sell you missions (or voyages) where you search for buried treasure, wrangle wild animals for trade, or hunt down skeletal pirates, respectively. You trade in the chest or pigs or cursed pirate skulls for gold, and you move on. That’s it. Except you don’t do it alone. Thieves’ big hook is that you can sail your merry way with up to three fellow pirates. If they’re randoms pulled from the aether of matchmaking, good for you. If they’re your real-life friends, even better. The genius of this game is that the simplistic framework allows for the rest of the game’s mechanics to be greatly expanded in a way few games of this ilk allow themselves. The thing about sailing the Sea of Thieves is that you have to actually do it. When you get a new treasure map, say, all you receive is a general picture of the island in question, and one big red X showing you where to dig. You have to head down to your trusty sea charts (which are wonderfully animated and realized, like most of this extremely pretty game, which will undoubtedly age well), and map your own way. Then you have to pull anchor, drop sails, and steer. When you find the treasure, you have to figure out where it is on your own, without any corresponding red X’s in the game itself. There’s no map markers, or waypoint, or anything else game-y. Doing all these things by yourself, while still keeping your cannons loaded and on the lookout for enemy ships on the 1-2 person Sloop, is taxing. Doing it on the giant Galleons is impossible. 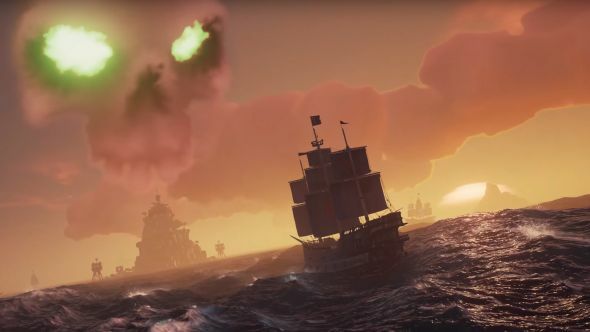 Ship to ship combat on the Sea of Thieves can start out rousing and end up comical, as everyone runs out of cannonballs and starts shooting themselves at their enemies. So the average Sea of Thieves voyage, despite being maybe just one treasure chest on one adjacent island, feels like an adventure. The seas roil and sway, storms can punch holes in your hull (which have to be manually patched, as does the water that will undoubtedly pool in the ship’s underdeck and have to be manually thrown out). Sharks can attack you if you disembark too far from shore. Snakes and skeletons and fire and death await you everywhere. But they aren’t your biggest threats. Those enemy ships I mentioned before: they’re staffed entirely by other players. This is where the most emergent, table top RPG-style encounters come into play. Unlike most other online multiplayer games, Thieves is completely unconcerned with stats. Everyone’s weapons do the same damage. Everyone has the same health. There’s no upgrading. All the things you can buy are purely cosmetic. That’s bound to upset some people, who have become so entrapped by the Skinner Box design of modern loot games that to do anything else seems foolish or otherwise a waste of their time. This style of design, to me, has two obvious advantages that some will miss. First, it makes things much friendlier to new players, who won’t immediately get blown away by high-leveled players with elite gear. Second, it forces every player to find something that they’re actually good at instead of just brute forcing their way through with stats. I’ve become pretty good at keeping my sense of direction, so I often navigate where we need to go and then head up in the crow’s nest and keep an eye out for both our destination and any scallywags who might want our treasures (that the only things that can be stolen from you are the chests and loot you accrue is a great touch that guarantees you only lose as much from a fellow pirate as you’re willing to risk). This makes Thieves feel much more textual and immediate than most games — a truly cooperative game, and not just a shooter that two people happen to be playing at the same time. Some of the more powerful skeleton pirates tap into some Breath of the Wild-style environmental puzzling that I am very here for. An example: just last night, I was sailing with three mateys — two relative veterans and one newbie. After showing the new guy the ropes (which is a legitimate crash course, as Thieves is not exactly a tutorial-rich game), we set off for treasure. At first, our new player seem completely overwhelmed, so we set him an easy task: load up all the cannons and then stay next to the midsails and adjust them (or tack them, as this game taught me. Using proper nautical terms is important if ye wants to be a true sailor). After a couple successful runs, we had a mid-level quest open up (every five reputation levels, a new group of voyages opens up for each faction). This one would take us across a bigger section of the map than any before. As we approached our destination in the murky darkness of the early morning, I spied not one, but THREE different enemy ships. One behind us, and two one the opposite side of the rock formation we were coming upon. I called out their positions, and my crewmates wisely turned off all our lanterns. The rearmost ship, either through ignorance or cowardice, slid right past us, and right in between the other two ships, igniting a 2 on 1 battle that lit up the sky all around us and left both our pursuer and one of their assailants sinking into the deep. It was several minutes before we even realized that we had actually ran aground on those rocks and were taking on water. Thankfully, our newest crewmember had noticed and fixed all the damage himself. Immersion therapy and all that. Trying to keep hold of the wheel during a storm is legitimately terrifying. And that’s not the scariest thing out there. I’d be remiss not to mention that one of the most enjoyable things about Sea of Thieves thus far is that I’m not paying for it. As the first brand new game released on the Xbox Game Pass service, it’s completely free for 14 days, and will only cost me $15 a month to keep playing after that if I want. Considering that over 100 games (including the first Fable, a game that feels like a kindred spirit to this one) are there, I’ll at least keep it going for a while. I said in my Zelda review last year that some great games are best described as composites of other great games. Sea of Thieves is in some respects one of these games. It has Portal 2‘s insistence of truly cooperating with other people. It has Dishonored‘s misty seas and groaning planks. It has Minecraft‘s boyish charm and whimsy. But there’s one game that I think anyone who plays Sea of Thieves will immediately think of the first time they drop sails and head out into the freedom of open water. And really, what better compliment can you give a game than saying it’s like the The Wind Waker? Words cannot describe how much I enjoy that they recorded different music tracks for when you’re playing underwater. I’ve only been playing this game for three days, and I already feel as though I have a dozen stories just like that one. The lack of any real narrative or questing structure makes it feel like every time I set sail could bring a completely new and truly emergent adventure, which is something doing the same authored raid in World of Warcraft could never bring. It’s like how there are two ways to play Grand Theft Auto Online: by slaving yourself to the grind of getting more guns, cars, and properties, or by grabbing a couple friends and doing a bunch of backflips off a mountain on some dirt bikes, then hijacking a train, then getting into a fistfight with a bunch of paramedics. I know which game I’d rather play, and so does Sea of Thieves. While it’s an open question just what kind of longevity this game will end up having, to this point it feels deeply unlike anything I’ve played in years. This brings me to the best aspect Thieves brings to multiplayer gaming. The lack of loot progression not only means that new players start on a level playing field, but that even they, through sheer tactical ingenuity, can win the day. I can’t say how long I’ll play Sea of Thieves. I at least want to get to these alleged “Legendary Pirate” missions, but until then, I’ve got enough to keep me going. Namely, it’s fun. Remember fun? Remember wanting to play a game not just to get an achievement, or to get that next pesky loot box? Remember making your own stories with your friend from Washington and your friend from Michigan and your friends from California and Florida and Tennessee? I still need to capture two of those white-feathered chickens, anyway. Thank you for an honest review. There are so many complaining about lack of content without realizing that they are the content. In the scale tests and the beta, now in the release, my own adventures have spawned more and better stories than could be scripted. I’m sad to report that the game has lost some of its charm by this point, but I still greatly appreciate my time with it.